In this lab demo, we’re going to install SCOM2012 on a member server. The following step-by-step walkthrough, starts from a newly built Microsoft Windows 2008R2 with SP1 Enterprise member server. 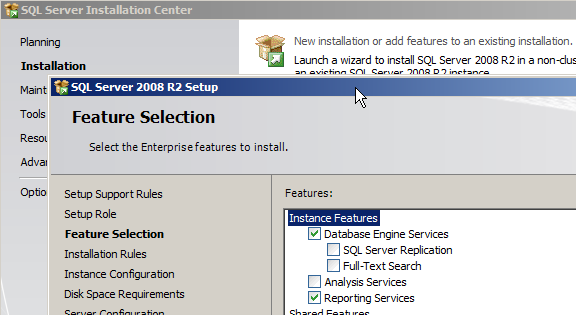 We already have a fully working SQL Server 2008 R2 instance on a different member server. · SQL Collation: IMPORTANT - install SCOM 2012 on SQL with the SQL_Latin1_General_CP1_CI_AS collation! Note: If you don’t yet have an SQL Server 2008 R2 instance, a standard Next Next Next type install with Full Text Search, will suffice for the following demo/pilot. Note: We use a remote database for the operational database, and data warehouse database; installing Reporting Services here serves to populate the SQL Server instance field when on the ‘SQL Server instance for reporting services step’ of the SCOM2012 installation (see here for more info.) The SSRS instance needs to be a separate instance to SQL instance used by SCOM. At this stage it would be worth updating the server with the latest Microsoft and Windows patches.